Anything that directly affects the quantity and quality of your production or causes variation in expected yield. If you've been farming for even a little while, you are probably well-versed with production risk. Which of the listed risks affects me by keeping me from getting to my goals? Which can I manage on my own? Which do I need help managing? How much benefit might I get from using protected cultivation? Would changing my pest management practices reduce crop losses? How can I minimize food safety issues in my production, harvest and post-harvest handling practices? 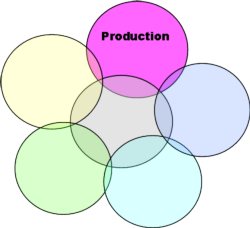 How can I bring down production costs? Will a new enterprise offer effective diversification? What knowledge and management skills do I need for an extra enterprise? Which extra capital investments and labor would I need to diversify? Do I have a serious commitment to a new enterprise? What are my major sources of production risk? What type of insurance coverage do I need for protection? What coverage is available to me? How much coverage do I need for adequate cash flow? Does adopting a new technology reduce my risk? What is the economic benefit of adopting new technology? Building a Safety Net with Crop Insurance - Cornell. Article gives examples for why crop insurance can be a useful tool in your risk management tool kit. Key Points to Consider for Various Alternative Enterprises - University of Florida IFAS. Details the capital and logistical considerations (such as land, knowledge, and skills required) to account for when considering an alternative enterprise. On-Farm Enterprises and Value-Added Products - USDA AFSIC.. Website compiling information on enterprise diversification resources. Post-Harvest Handling, Direct Marketing, and Quality Control - UC Davis Small Farm Center. Harvesting, packaging, and post-harvest procedures for maintaining food safety and quality. Food Safety Webinars - Vermont New Farmer Project. Includes "Practical Food Safety for Produce Farms" and "Managing Food Safety Risks in Agritourism," both from 2011.